The Grab Bag Part Deux-Reviews and GiveAways! : TheGrabBag2 Giveaway Fridays! Link up here to post your giveaways! Hurry Giveaway ends April 30th! 2 Light Up Scissors Sets! Gifts in a Jar Cook Book For Kids! A GrabBag of Goodies Makeup Bag! Leave a comment after linking Please! Hi there. I found your blog through Friday Follow. 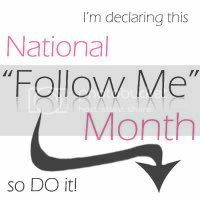 If you are interested in becoming a follower of my blog, I will happily follow yours. This is Jacki (AKA I'm a Mom). Thank you for the follow, I am following your other blog, and decided to follow this "lonely" blog as well! Giveaway for the Top 24 Soul Cd ends Tomorrow! What's going with the Random Generator site?